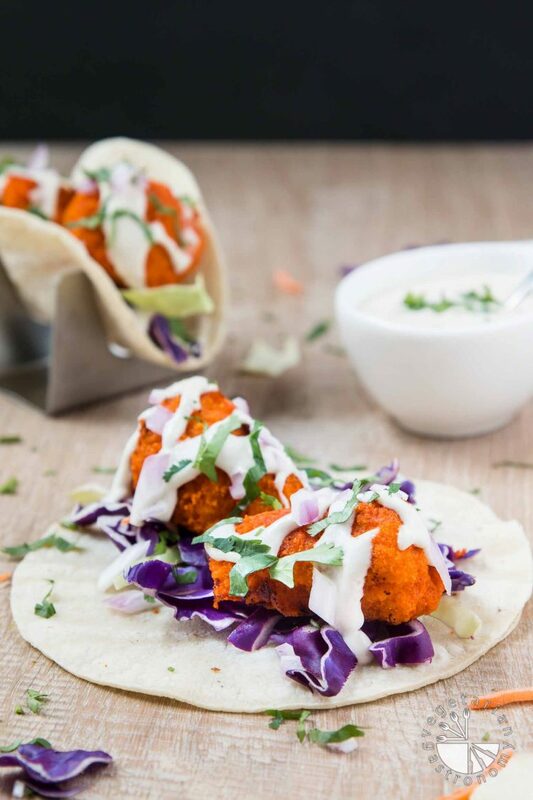 These vegan buffalo cauliflower tacos will make you pause and savor every singe bite!! Imagine plain, boring cauliflower (one of the few vegetables that I’m not a fan of in their raw form). Now imagine them as breaded large pieces and baked in the oven. Next, toss them in my home-made vegan buffalo sauce and bake them once more. That cauliflower just went from plain and boring to mouthwatering and irresistible. 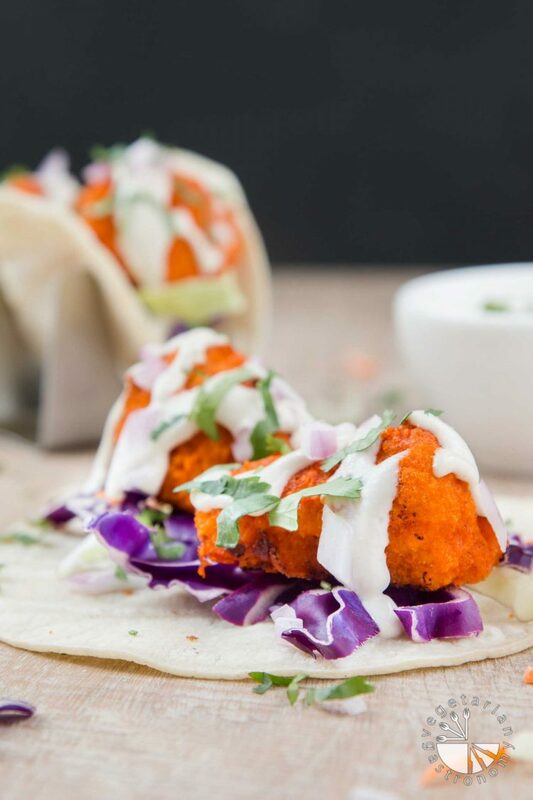 Stuff these mouthwatering buffalo cauliflower bites into a grilled corn tortilla. Add some slaw for crunchy texture and drizzle on my popular creamy vegan cucumber ranch. Top it off with some fresh herbs, red onions, and citrus! Are you drooling yet?? Have I hooked you on cauliflower?? 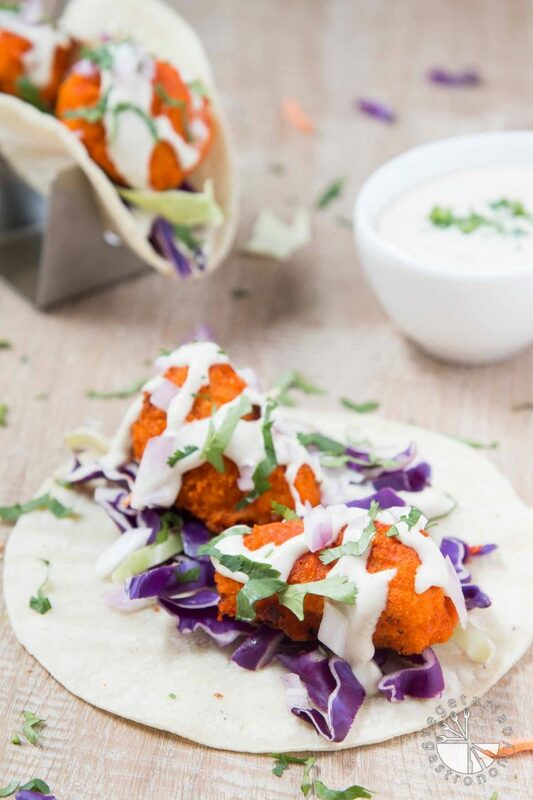 Well either way, they’re FINALLY here…it’s my Vegan Buffalo Cauliflower Tacos recipe that I know many of you have been waiting for! I created them this past December to serve at our annual holiday party. They were a huge hit back then and have continued to be a staple in our home ever since! These cauliflower tacos are perfect for any dinner party or upcoming Cinco de Mayo celebration (can you believe it’s April already?!?)! The buffalo cauliflower bites can easily be made ahead of time, stored in the fridge, and quickly re-baked in the toaster oven for an easy weeknight meal. You can even turn them into appetizers or small finger foods by making mini tacos and serving them on these awesome mini 6 shooter taco racks I found from The Taco Rack. I’m in love with these racks and have their mini shooter series and standard triple and six shooter racks. They’re stainless steel and you can even place them back in the oven after filling them. (And in case you’re wondering… I was not paid for mentioning these racks). I honestly just love them and how fun it is to serve up tacos on these racks. Believe me when I say that you’ll be craving these tacos every week. All you need is one bite and you’ll be hooked. 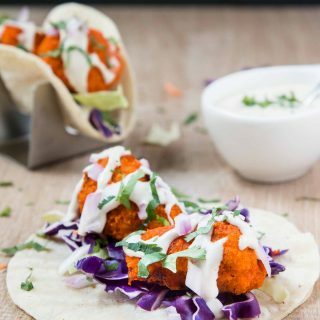 I know many of you have already made my crispy baked buffalo cauliflower bites, so stop drooling over these photographs and try your hand at making these easy Vegan Buffalo Cauliflower Tacos with cucumber ranch, slaw, red onions, and fresh herbs! I recently started ‘RE-MAKE FRIDAYS‘ on my Instagram where I love sharing all your gorgeous re-makes of my recipes every week! So be sure to check out what people are making and don’t forget to tag me with your re-makes for a chance to get featured on my feed, tag me both @vegetariangastronomy #vegetariangastronomy so that I don’t miss it! Crispy, crunch, cool, and creamy. 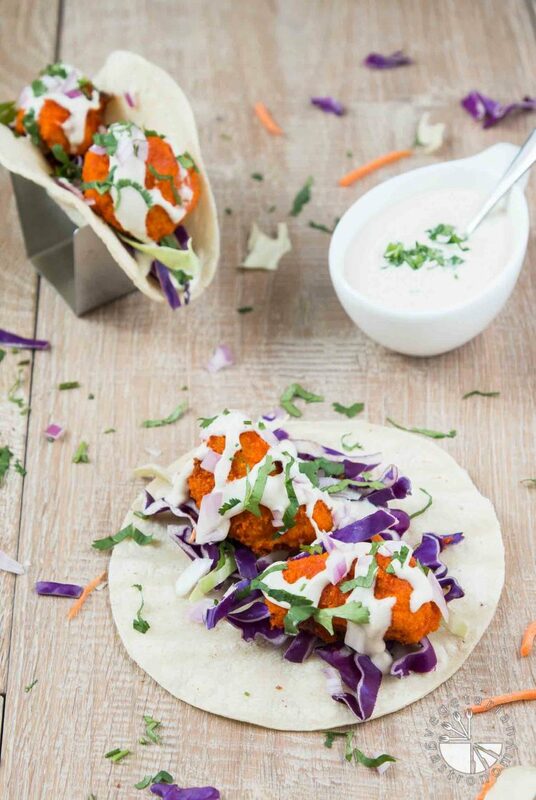 These vegan buffalo cauliflower tacos will make you pause and savor every singe bite!! Using a non-stick pan, grill each corn tortilla on each side with a small amount of avocado oil. Add some slaw to the middle of each grilled corn tortilla. Next, add 2-3 prepared buffalo cauliflower bites (amount depends on the size of the corn tortilla and bites). Top with some prepared vegan cucumber ranch, chopped red onions, fresh cilantro, and a squeeze of fresh lemon juice. Enjoy! Prep-Ahead Tip: For best results, bake the buffalo cauliflower bites right before assembling the tacos. But you can easily prepare the buffalo cauliflower bites and vegan cucumber ranch ahead of time or the day before and store in an air-tight container in the fridge. When you're ready to serve, simply pre-heat the toaster oven to 375 degrees and bake to heat through and crisp. Leftovers can be stored and used in a similar fashion. These can be served as regular size tacos or mini-tacos. 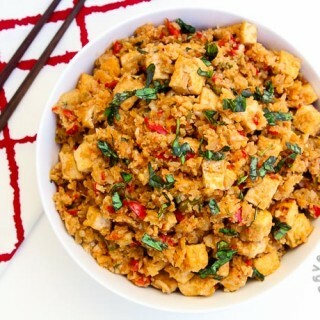 Looking for more Vegan Cauliflower Recipes? I don't eat a lot of vegan food, but this would be a hit in my house! I make a buffalo cauliflower wrap!!! It's delicious- I love this idea!!!! Yes! I think i've taken the contents of this taco and wrapped it up as well at some point when I ran out of corn tortillas! So good! Great dinner party food! 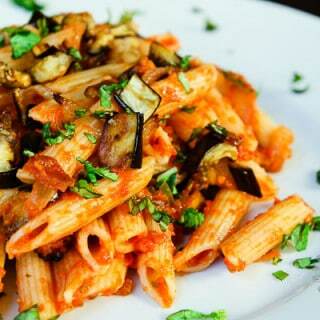 Fun, flavorful and healthy! This is the kind of food that even meat eaters would enjoy. I think all my friends who had it that night would agree ha! They loved these tacos! Um yes! I totally am drooling at your description of that cauliflower actually haha. I've never tried cooking it this way but you've got me totally inspired to try it, especially in this amazing looking taco. Thanks for sharing! thanks Laura! Haha...that description was meant to entice, but the recipe and flavor really says it all! Let me know if you try it! These look amazing and healthy! I need to try these yesterday! Looking at these pics, I was drooling but now I am hooked! These look absolutely scrumptious and I love the taco rack :) Your pictures are so inviting and on point x well done! Thanks Reshana! The pictures are definitely drool worthy ha! But they taste even better so you need to try them! 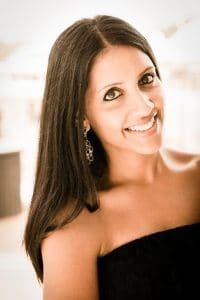 Thank you Rashmi!! The taco racks really are everything...they are available online! You guys need to try these tacos out, especially if you love cauliflower! These would be a hit in my family! Buffalo cauliflower AND tacos!? You made my day - these look delicious! Thanks Mary! they are delicious! I'm definitely making these tacos! I love all the flavors you have going on here! Looks very delicious Anjali:) Frankly I never made anything with buffalo sauce. But I ate in restaurants like Tofu buffalo wings like that. Do you make your own sauce? I like to make these tacos, looks super tempting! 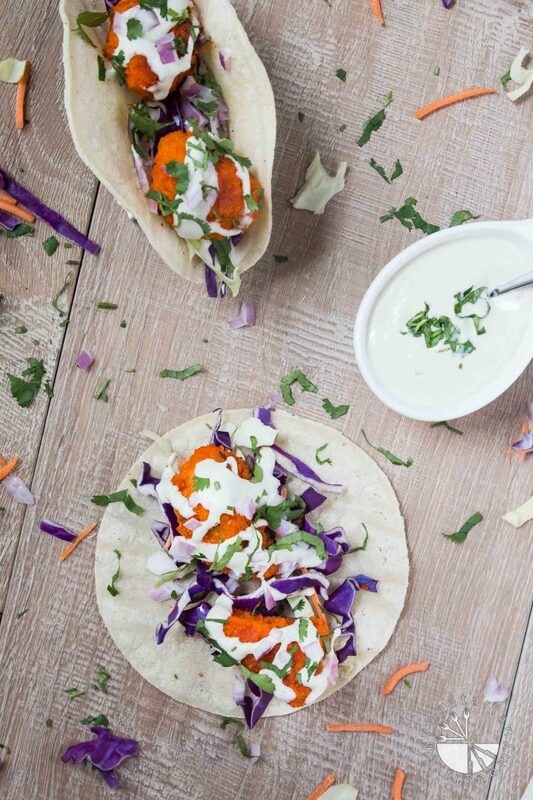 Definitely try making the buffalo cauliflower and then make these tacos! They are so good! And yes, make my own sauce...super easy. I don't know how close it is to actual buffalo sauce since I haven't tried many, but this tastes pretty awesome. Let me know if you try it! Loved this recipe! Buffalo cauliflower wing sauce had a nice bite to it...my partner (a wing lover) said it was amazing! The cucumber ranch dressing is a great addition to the taco! Thanks! We will be making this one again! Thank you so much for the great review!! So glad you loved it...and yes...i'm addicted to that cucumber ranch dressing! I just made these! They were amazing! Your recipes are so easy to follow and not intimidating. Thanks!